Joe teaches you how to get the best possible sound from your guitar and how to play the solid rhythm and great bluegrass licks and bass runs used by all of the famous professional artists. When you finish this video you will have the skills to play all the chords, licks, and runs on almost all of the famous records. 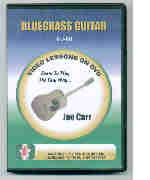 Joe also teaches you how to use the capo and play many all-time favorite bluegrass songs. Joe's great teaching experience makes every project a lot of fun.